1. 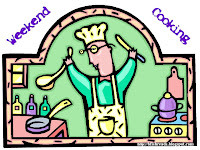 Weekend Cooking is hosted by Beth Fish Reads and her post and review of The Crabby Cook Cookbook is very funny. I often get busted by not reading the whole recipe through and this is how mistakes are made. Click to her post to see the Lemon Drop Recipe she made for herself. Yum and makes me think of summer. 2. I woke up this morning and am still not out of bed. You might think I'm sick but nope just tired, really tired. I've not slept perfectly all week. I wake up at like 3:45 a.m. and struggle to get back to sleep. I'm not awake enough to read but not asleep enough to dive back into dreamland. I don't know how to solve this crazy sleep pattern or what is causing it. 3. We had friends over last night and I made Garbanzo Noodle Soup and a lovely salad. We ended the night with a rousing game of Guesstures. Have you played this game? It is hysterical and perfect for people of all ages to play. Think charades in that you act out the four cards while your cards rest in this mechanical timer, which drops the cards down if you don't grab them quick enough. It is well worth the $24.00 if your family loves games like ours does. We laughed a lot and I got some great video of several key moments! 5. I do have a lovely dinner planned of Scottish Salmon and a pound of Cod to cook up. I have some organic baked potatoes to make and green beans, snapped and ready to go. I will get up to make these bars later today. Other than that what makes this post worthy of Weekend Cooking you ask?? This dessert. My kids will love me. 1. Line bottom of 8-in pan with parchment paper or foil coated with cooking spray. Leave an overhang. 2. Thoroughly wisk flour, baking powder, and salt in a small bowl. 3. Melt butter in med. saucepan until sizzling. Remove from the heat and stir in the cocoa, then sugar. (will look like dark brown sugar) Add egg, egg whites, and vanilla. Stir briskly until smooth and glossy. Stir in the flour mixture until just incorporated. Then stir briskly for another 50 strokes. [really??] Scrape the batter into the prepared pan and spread evenly. the batter will be very shallow in the pan. If you have time, cover the pan and refrigerate for a few hours or up to 12 hours. [(This hydrates the cocoa powder and flour and brings all the flavors sharply into focus) Remove from the refrigerater about 30 minutes before baking; preheat oven to 350 degrees. 4. Quarter marshmellows with an oiled knife [I have some mini-marshmallows to use instead] Distribute the pieces over the batter, pressing them in. Distribute the nuts [i'm using pecans] and chocolate around the marshmallows. 5. Bake brownies unti the marshmellows are golden brown, 25 to 35 minutes. You can use the toothpick method; toothpick will come out still a bit moist. Brownies in a metal pan will bake faster than those in a glass pan. [I did not know this until just now]; if you are unsure, bake a few extra minutes. Let cool completely in the pan on a wire rack for about 2 hours. Lift the ends of the pan liner and transfer to a cutting board. Cut into 16 brownies. Click here...Rocky Road Brownies...if you want the pure unadulterated version, without my crazy comments.